A picture book based on the traditional Japanese folktale about a cat who brings good luck to a poor temple when she beckons a samurai lord to shelter there. The first Maneki Neko (beckoning cat) statue is said to have been made in this temple cat’s honor. Looks to be a beautifully illustrated picture book based on the traditional Japanese folktale about the cat who brings good luck to a poor temple (publication date is August 2011). This is a gentle and appealing picture book story based on a different version of the Japanese folktale about the first beckoning cat (Maneki Neko). In this version of the story, a poor fish-seller boy shows kindness to a stray cat. When the boy’s father is sick and the boy can’t go out to sell his fish, the cat helps by leading people to the boy to buy fish. Story strays from tradition, but the core is true to one of the traditional Maneki Neko tales, and the story is simply and well told. In this version of the maneki neko story a young toy-maker attempts to save an injured cat, but the cat dies. The cat later appears to him and beckons, saving the young man from being hit by lightening. The young man is invited to stay at a nearby temple and introduced to a craftsman who helps the young man learn how to make a clay cat in memory of the cat. Some elements in the story reflect the traditional folktale (eg. the cat beckoning someone away from a tree during a thunder storm, person finding shelter in a temple), but the main story line is a bit disjointed and seems to be attempting to tell more than one story. It also suggests that the first cat statue had a moving paw and was created as a toy, which is not accurate. The illustrations are lively and include interesting details. The book is available in English-only as well as eight bilingual editions: English with Arabic, Chinese, Japanese, Hmong, Korean, Spanish, Tagalog and Vietnamese. This is a chapter book (short, easy-to-read novel for children) about a Japanese-North American girl and a Japanese bakery run by the girl’s grandmother. When the bakery’s Maneki Neko statue goes missing, the girl sets out to find it and return the bakery’s lost luck. A contemporary multicultural story about friendship and love –with a touch of mystery and magic. A quirky, fun children’s story and art book about a boy whose cat brings him a magical 10-yen coin that seems to transform everything into a cat or cat-shape. The text is in both Japanese and English, and the artwork includes illustrations as well as photographs of cat-ified toys and candy. Both children and adults will enjoy this book (may only be available in Japan). This is a self-published book of photographs the author (a professional photographer) took of lucky cats found mostly in New York’s Chinatown. Great images, but the book is very small, with only 24 pages of photographs, all similar close-up head shots. Does not include the intriguing lucky cat photos featured in this interview with Sheri Lynn Behr. You can check out Behr’s lucky cat portraits here. 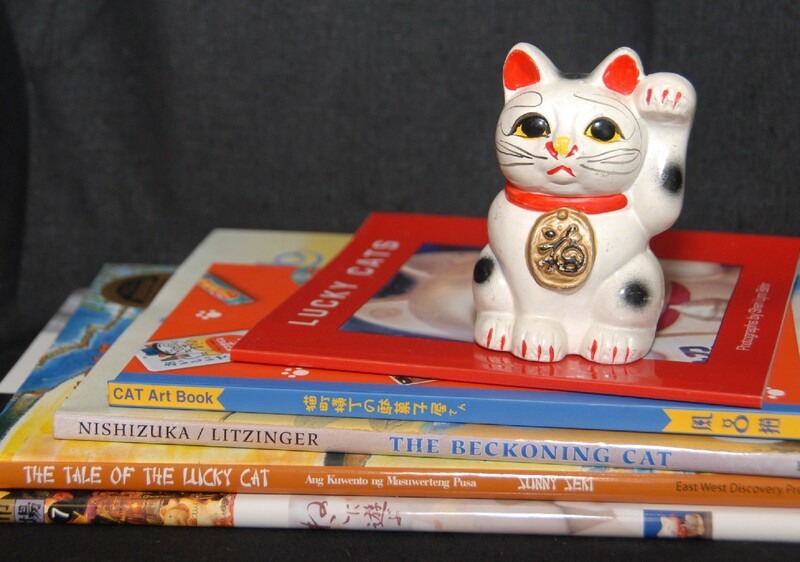 A nonfiction book that discusses the origins of Maneki Neko in various folktales, beliefs and superstitions involving cats and good luck. Haven’t been able to get a copy of this book, but it is quoted in this article about Maneki Neko figures by Alan Scott Pate. An extensive look at Maneki Neko figures by Japanese folk art expert Alan Scott Pate. The book was published to coincide with an exhibit of antique beckoning cats at Mingei Museum in San Diego, California (running March 13, 2011- January 15, 2012). I love Maneki Neko. I stumbled upon this iPhone App. Lucky Cat for your pocket! PS: love you page. Keep it up! Thanks, Samson! I’ve seen a few lucky cat apps, but haven’t tried any yet. Once I do, maybe I’ll post a review comparing them.